You are the visitor to our page! We are the Sons of Union Veterans of the Civil War. We are the descendants of the men who fought to save the Union. Their blood runs in our veins. We are not about "representing" Civil War soldiers, we, as descendants and legal heirs to the G.A.R. are a direct link to these men. We honor our ancestors by keeping alive the memory of their service and sacrifice in a way that no other organization can. The new Tiger Camp was established on January 5th 2008. Members send in your 2015 Dues for SUVCW and SVR the deadline is here! 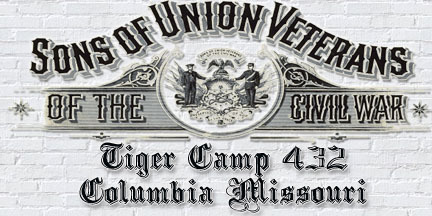 The Sons of Union Veterans of the Civil War is a volunteer, non profit, patriotic and educational organization. It was founded on Nov. 12, 1881 and was incorporated by an Act of Congress Aug. 20, 1954. The Sons of Union Veterans of the Civil War is the legal heir to and representative of the Grand Army of the Republic. Carpenter James Bruckle built a blockhouse at the crossing of Broadway and 8th Streets. It had port holes to shoot through and a well inside, dug in the middle of Broadway to furnish water in case of siege. It was called "The Tigers Den." 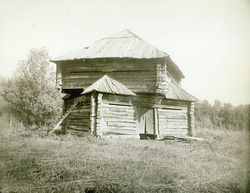 They also took possession of and fortified the old courthouse in the center of town. A ditch was dug around the courthouse to prevent attackers from throwing a load of hay against the courthouse wall and setting fire to the building. Sentinels were placed on the top of the courthouse and of the cupola of the university. The courthouse and church bells of the city were used to signal the approach of any bushwhackers. Three times marauders approached Columbia but the bells and call to arms kept them outside the city limits. The reputation of the intrepid "Tigers" presumably traveled abroad, and Anderson's gang detoured around Columbia.